In a world where customers have plenty of choices, you need more than just a great product in order to succeed. You need a clear strategy. Most important, you need the right tools to capture leads, to get to know them better over time and convert them into contacts, in the most efficient way possible. What’s even more important, you need to gather lead intelligence step-by-step, without being overwhelming and intrusive. Think of it like a normal interaction with a person; you don’t ask someone if he/she is married right off the bat. You get to know them, you build trust over time, you become confident. Same goes for the interaction with potential customers. You don’t ask them whether they want to buy your product or not out of nowhere. You first need to know them, you have to understand their needs and wants. And what’s the better way to get to know someone? By asking questions, of course. Ask and you shall receive. Let’s consider a concrete scenario. Let’s assume that you’re a real estate company, and you’re trying to convert leads into paying customers. You’ve built the marketing strategy, you’re capturing leads from various channels such as forms, social media, paid advertising and so on. People visit your page and you send tracked emails containing similar properties, based on their browsing behavior. Yet, something is missing; leads are not engaging with you. This shouldn’t come as a surprise, though. You know very little about them. What you need to do is ask the right questions, at the right time. You don’t want to overload leads with information, though. The purpose is getting to know leads over time, step-by-step, without being intrusive or annoying. Enter dynamic push content. By using dynamic push content into your website, you not only understand what the lead really needs, but you also reduce the amount of time it takes to convert him/her into a customer. Now, let’s further suppose that a lead visits your website. 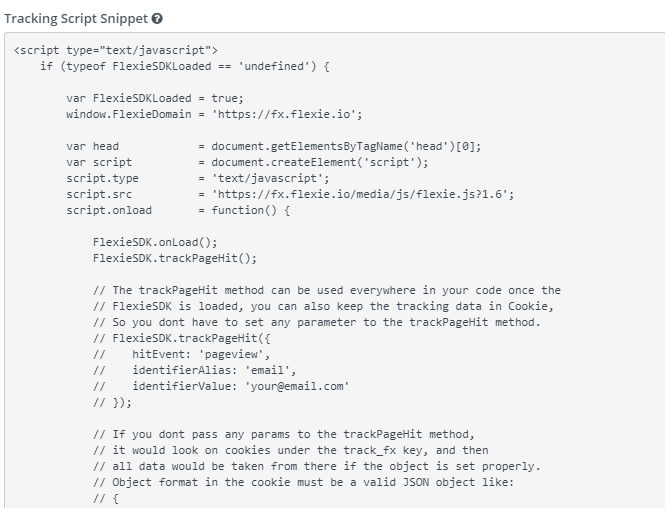 You’ve inserted Flexie’s tracking snippet into your website (see below how you can do this), and you’ve tracked the lead. John is looking at properties in your website, but you don’t know the home type he’s interested in. At this very right moment, you can show to John a small, short and non-intrusive pop-up asking for specific information: “Hey John. Let us help you. What home type are you interested in? (Insert the options and let the lead choose)” This push content is short and to the point. It asks for specific information, and it doesn’t overload John with other information. Being so short and helpful, John responds to the question: he is looking for a condo. Armed with this knowledge, you send to him list of condos that might be of interest to him. John keeps looking at condos, and he does that by searching in the map. At this moment, you show him another small, short and non-intrusive pop-up, this time asking for the area he would like to see condos. Next, you send him periodical emails with list of condos in a particular area. Now you have something: you know that he’s interested in buying a condo, and you also know the area where he would like that condo to be. John is looking for condos in a particular area, and he is also using the price range in your website. At this very moment, you show him another pop-up, this time asking for the price range he would be interested in. John gladly answers, and you send him other content with lists of condos, in a particular area, within a given price range. Thanks to the push content you’ve shown through short and non-intrusive pop-ups, John is now more engaged, but he hasn’t decided just yet. He keeps looking at condos in your website, and wonders whether if he can meet with someone in person, to see the condo in person. At this very right moment, you show him another pop-up where you invite him to contact your sales team. Because he know your company, because he has interacted with you, John is now a more qualified lead than he was at the beginning, the time when he was just looking at properties in general. Notice a trend here? Yes, you guessed it right. You asked different questions over time. You asked the right questions, at the right time. Without ever being conscious of it, you did progressive, step-by-step profiling, thus gaining accurate and complete lead intelligence. You don’t have to do all this manually over and over again. 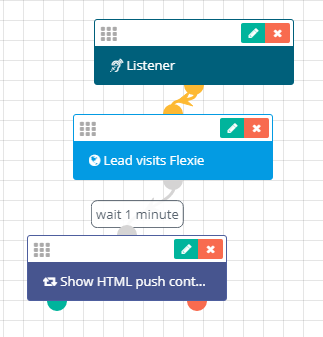 When you automate the process through Flexie CRM, amazing things happen. You do this by building workflows, so that you can show specific content into your website to whomever you want, and whenever you want. To get a better idea of how push content works, we’re going to use a concrete example. Let’s suppose you want to ask something specific when a lead visits your website. The lead has already signed up for an account, but you want to know more. To do that, you need to be very specific. Before you proceed to doing progressive lead profiling, you need to track and identify the lead. To do that in Flexie CRM, you should first copy the tracking script snippet and then paste into your website. All you have to do is go to Settings -> Configuration -> System Settings -> Tracking Settings. Once you copy and paste all the tracking snippet into your website, you can proceed to testing how the push content will be shown to the lead. To do that, first go to Push Content and on the drop-down menu click Manage Push Content. To create a new Push Content go to upper-right corner of the panel and click New. Select Lead as the entity type, and on the right you can choose between HTML, FORM or JSON as your push content type. We’re going to choose HTML. We’re going to give it a name, and add the text and HTML content. On the right side of the panel, you can choose where you want the HTML content to show when the lead visits the page, its positioning. You can show it on the top right, top left, bottom right, bottom left, or into a specific container(DIV). We’re just going to choose Modal UnLocked. This means that the HTML push content can be removed by simply clicking ‘X’ or ‘Cancel.’ Unlike a Modal Locked which is intrusive, and where the lead cannot browse within the page unless he/she submits the form or provides the information asked in the pop-up shown on the page, the Modal UnLocked is non-intrusive and it allows leads to simply remove the push content form by clicking X or Cancel, and browse the page as he/she wishes. Next, click Save & Close. You can easily build a workflow where the lead will be shown the push content 1 minute after he/she has visited the page and is still browsing. You not only decide whom to show the push content to, but also when. You can easily test how the push content would show when a lead visits the page. To do that, first go to Push Content -> Manage Push Content and click the push content created earlier, TEST HTML. Once you click Test, below is how the push content form will be shown to the lead upon visiting Flexie. 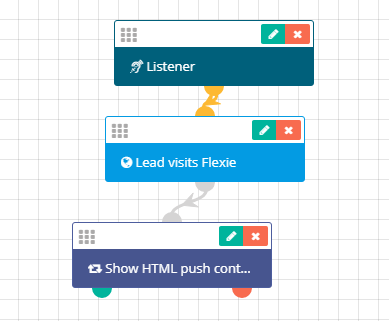 Once the lead that has already signed up for the Flexie product visits the page, the workflow automatically show the push content to the lead. You can easily build other scenarios, more complex. Dynamic push content into your website helps you do an accurate and step-by-step lead profiling, thus shortening the sales cycle and being more efficient while doing so.